Jeanette Clough's collection, Island, is forthcoming from Red Hen Press in Fall 2006. Cantatas appeared in 2002 from Tebot Bach Press, and she is also author of two limited editions, Celestial Burn (Sacred Beverage Press) and the chapbook Dividing Paradise (The Inevitable Press). Among the journals publishing her poetry are Colorado Review, Denver Quarterly, Nimrod, Ohio Review, Atlanta Review, Poetrybay.com, and Pool. 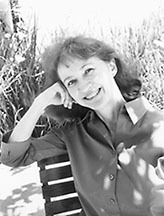 She edited for Solo, A Journal of Poetry and contributes reviews to Poetry International, received Honorable Mention in the 2005 Ruskin Poetry Competition, and has also received awards from the dA Center for the Arts, the Rilke Poetry Competition, and the Los Angeles Fin de Millennium competition. She is a native of Paterson, New Jersey, and received a Masters degree from the University of Chicago.